The March issue of Uncut that has just hit the shelves features a massive three page feature on Les Savy Fav, a Gallows feature and a nice three star Danava album review. How do you like them apples? Tasty. The video for Fightstar’s brand new single ‘Floods‘ is currently exclusively hosted by Tiscali this week. The ISP whose monthly unique users are at about 6.8m were stoked to get the first week online. 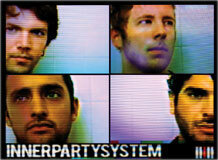 4 piece Pennsylvanian dance/rockers Innerpartysystem join Division’s print press and online pr roster this week. Look out for their debut album dropping in April via Island/Fallout Records. Bullet For My Valentine’s 2nd album ‘Scream Aim Fire’ is number 2 in the UK midweek chart, number 1 in Japan and number 2 in Germany this week. Their amazing Division online pr campaign continues to fuel the fire..
Everyone’s favourite magazine for freaks and sickos fell in glorious lust with New York’s Gay For Johnny Depp this month with a tasty feature. They arrive in the UK this friday. God help us all. 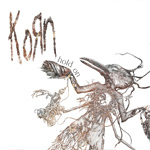 This week US rock monsters Korn grab a video exclusive at Myspace with new single ‘Hold On‘ released February 4th. The band are currently on a UK tour with zines all over the country reviewing the band. Saviours slay the broadsheets today with a good review for their debut album on Kemado Records. “Into Abaddon is a worthy half-hour of heaviness,” understates Jamie Thomson. Oakland riff-masters Saviours received rave reviews in Kerrang (4 K), NME (8/10) and Time Out this week for their heavy-weight debut ‘Into Abaddon‘ on Kemado Records. Watch out for their tour with The Sword at the end of March! London rapscallions The Metros are taking part in E4’s ‘Skins‘ premiere parties happening across the country to celebrate Series 2 of the hit-show. This coming March 31st will see the release of a new album titled ‘My Bloody Underground‘ from the warped genius that is Anton Newcombe. The album opens with the song ‘Bring Me The Head Of Paul McCartney On Heather Mill’s Wooden Peg (Dropping Bombs On The White House)’. Say what you like about Anton and BJM, but they are never, ever boring.